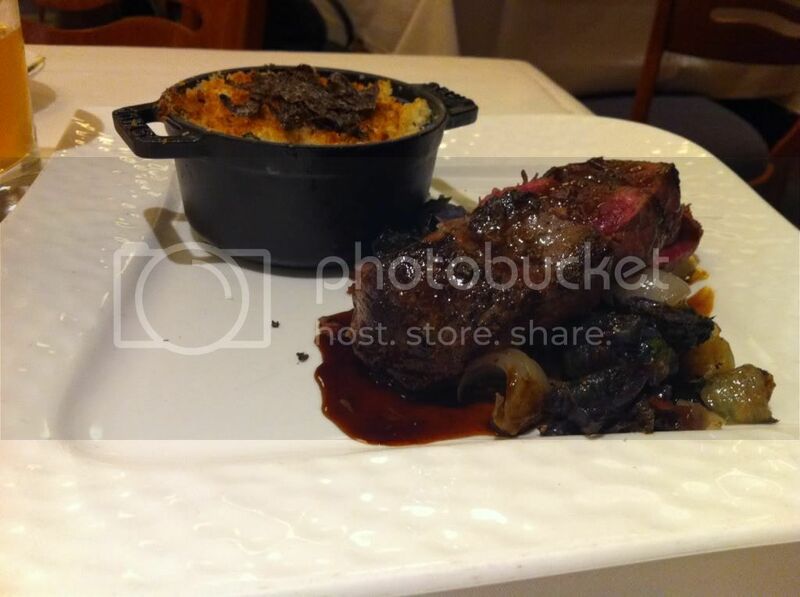 Fatgirl Hedonist: California Grill: Walt Disney Isn't Just Burgers and Chicken Nuggets. California Grill: Walt Disney Isn't Just Burgers and Chicken Nuggets. I recently went to Disney World and had all my misconceptions about the food offered on Disney property blown to pieces. For as long as I can remember, going to Disney meant eating horrible food with a guarantee of indigestion. I packed my Imodium and Pepto and for the first time ever, I didn't use it. I went to a few good restaurants while on vacation, but for the purpose of the blog I'll only cover my favorite one, California Grill. It was so good we actually went twice. Because great food is almost impossible to come by in Disney, reservations for California Grill definitely fill up... especially for dinner. 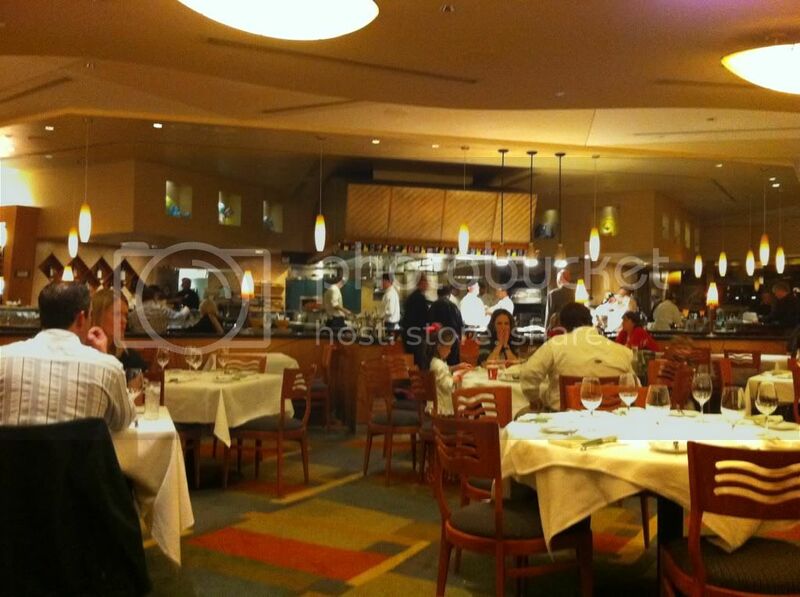 The restaurant is actually in the penthouse floor of the Contemporary Hotel, right next to Magic Kingdom. Many people don’t realize the restaurant also has an outside observatory where people pile in every night to watch the fireworks display from Magic Kingdom. The restaurant itself is large with a massive open kitchen. The decor seems a bit stuck in time, circa 1995, but rest assured the cuisine is definitely in the 21st century. The menu has a little bit of everything even a Sushi bar. I stayed away from the sushi menu because of my shrimp allergy and instead I had their Jumbo lump Crab Stack as an appetizer. 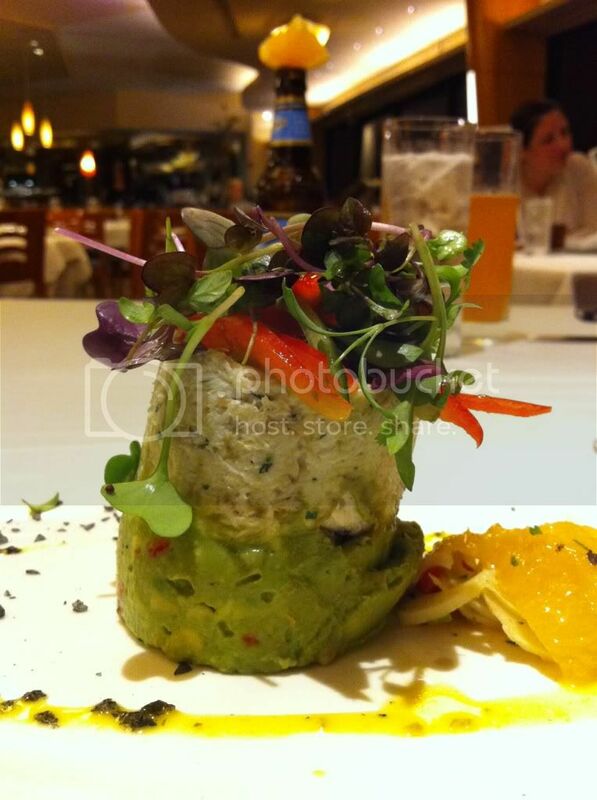 The stack was pretty much a crab salad neatly plated over a freshly made guacamole, topped with thinly sliced red peppers and greens. 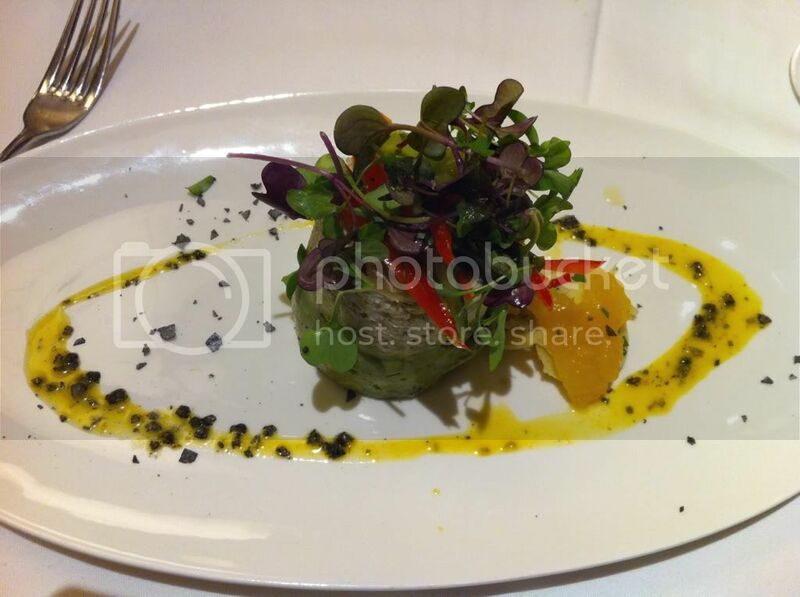 As a garnish around the plate, there was honeyball vinaigrette and black sea salt. Albeit this was a relatively simple dish, the freshness of the ingredients really made the flavors pop in your mouth. Plus, it was a hell of a lot better than the corn dog nuggets I would normally have for dinner at Magic Kingdom. We also had their Triple Cheese flatbread. 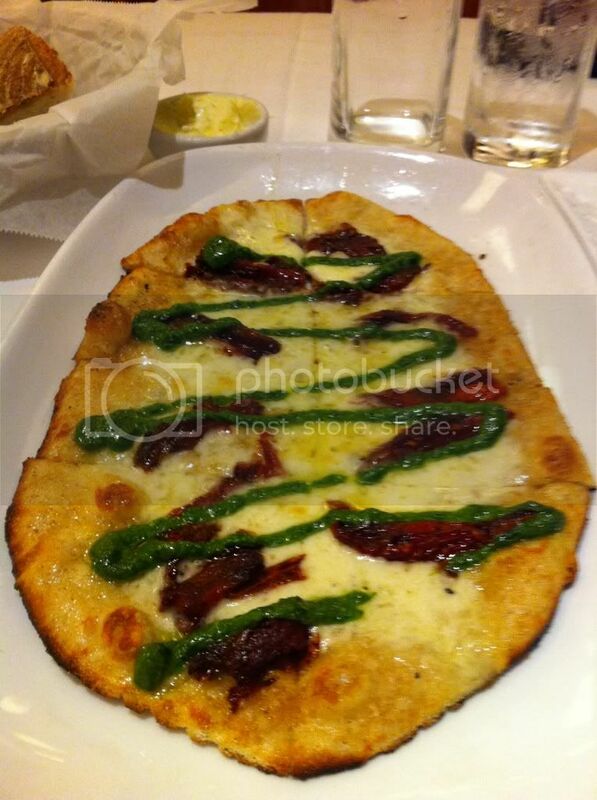 A thin crust pizzette with pecorino, asiago and provolone cheeses, sun dried tomatoes and arugula pesto. The cheese they used had a much sharper (almost pungent) flavor than your typical mozzarella and it went great with the tomatoes and pesto. It was simple yet really good, but definitely not your typical pizza. 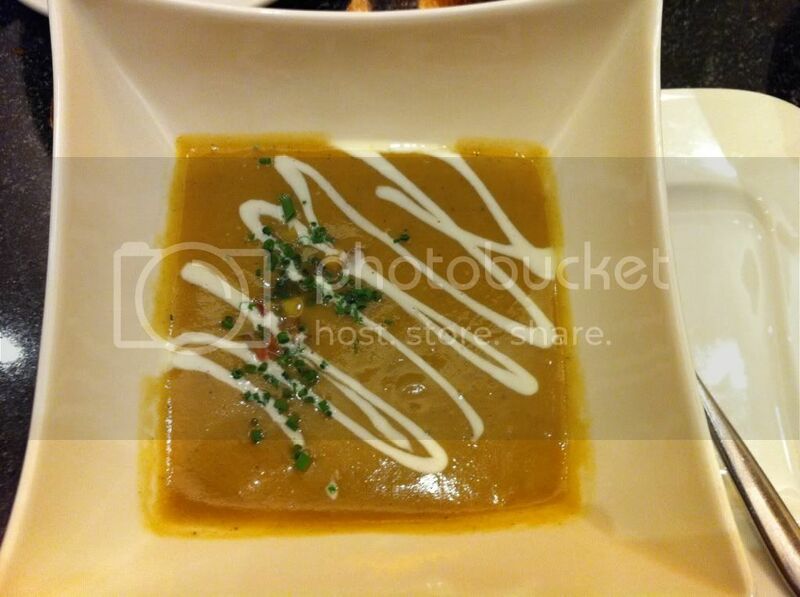 Another appetizer we got to try was their Heirloom Sweet Potato Soup. The menu describes the soup as coming with smoked bacon, red pears, minus 8 verjus. You're not the only one that doesn't know what the heck minus 8 verjus is, I had to google it also. Turns out it is a vinegar alternative made from un-ripened grapes, http://en.m.wikipedia.org/w/index.php?title=Verjuice&mobileaction=view_normal_site. The soup didn't taste how I expected a sweet potato soup to taste; it was much more earthy and smoky. I suppose I was expecting a sweeter soup. I was a bit disappointed though, part of the reason why I ordered it was because it said bacon, but there was no bacon to be found. Either way, it was really interesting, different and I definitely enjoyed it. 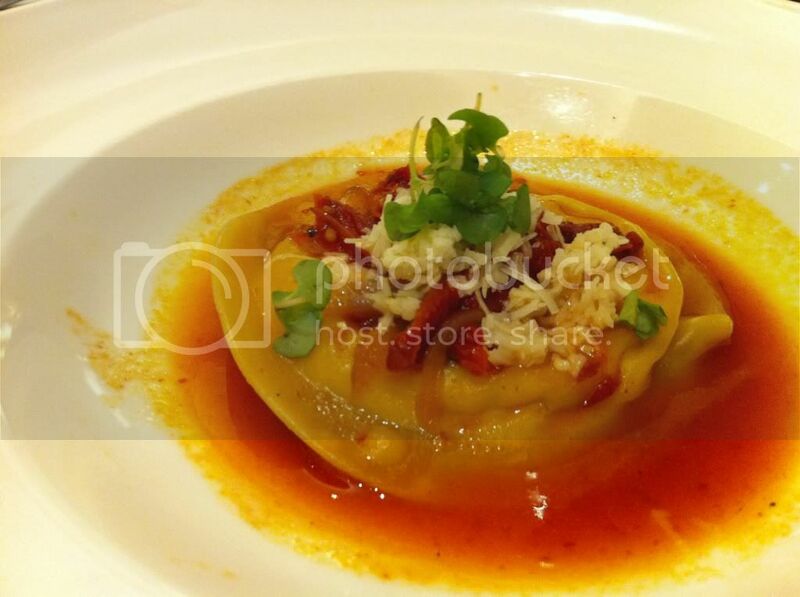 We also tried their Sonoma Goat Cheese Ravioli. The ravioli were giant ravioli topped with sun dried tomatoes, pesto and shitake mushrooms. John tried this one and I ended up not having a bite, but between John's groans and him nodding his head I think it's safe to say he really enjoyed it. Finally, I start talking about entrees! I had their grilled pork tenderloin. 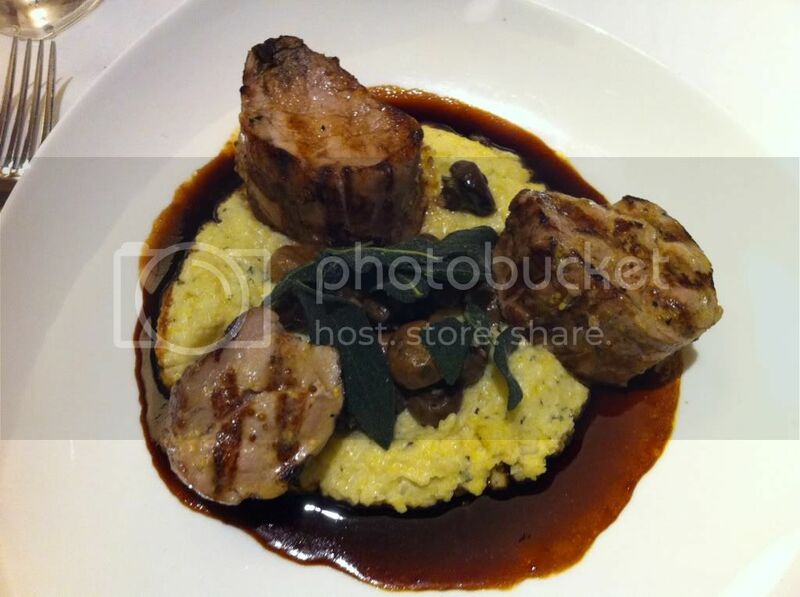 The tenderloin came with goat cheese polenta, roasted mushrooms with a Zinfandel glaze and topped with sage. This was easily one of the best entrees I've had in a long time. So good I had it the two times I went. The pork was juicy and so flavorful; soak it up with some of that Zinfandel glaze and holy hell you're in heaven. It was so good that I couldn't help but moan in delight (that's what she said). The goat cheese polenta was also another highlight; it was creamy, cheesy and had a nice sharp flavor from the goat cheese. Simply put, it was amazing and the people sitting next to us kept looking at me like that scene from 'When Harry Met Sally." John had their cast-iron bison with brussel sprouts and truffled mac and cheese. The Bison was cooked medium rare as suggested by the chef and although I didn't try it, John swears it was delicious and well seasoned. The brussel sprouts looked great, but I did not try them. They were sautéed with onions and bacon (you can never go wrong with onions and bacon). What I did try was the truffled mac and cheese now that I can say first hand was delicious. 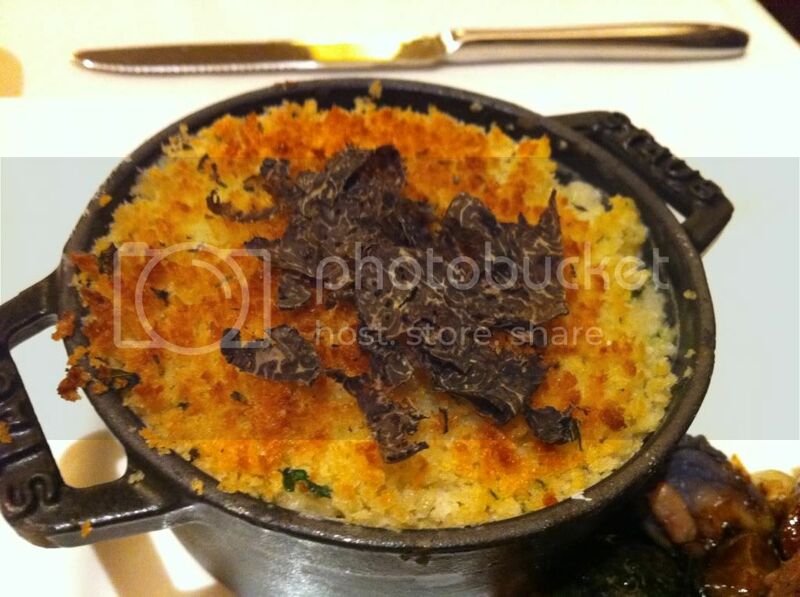 It comes in its own little cast iron pot and it's topped crispy panko bread crumbs and truffle shavings. This is how mac and cheese should be, ooey, gooey, creamy and packed with flavor. I know a few places that could definitely learn a thing or two. 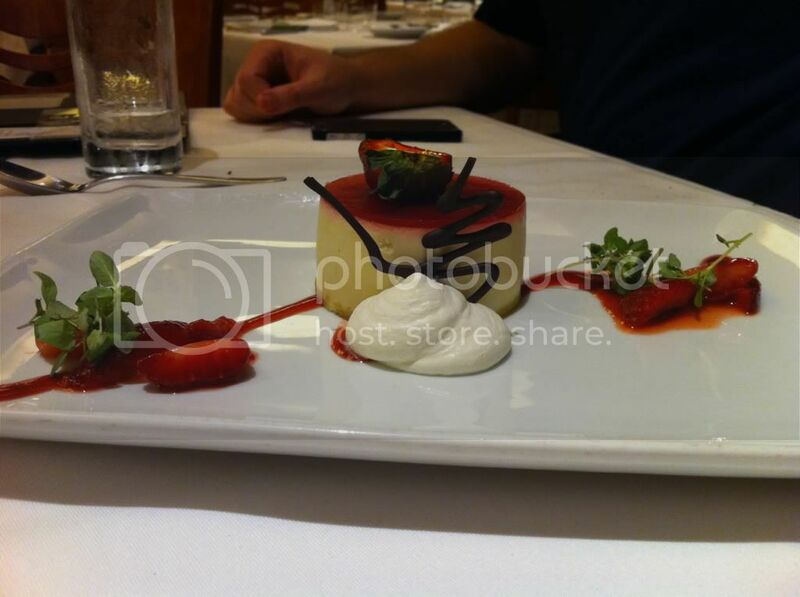 The last dish we had was their strawberry cheesecake. 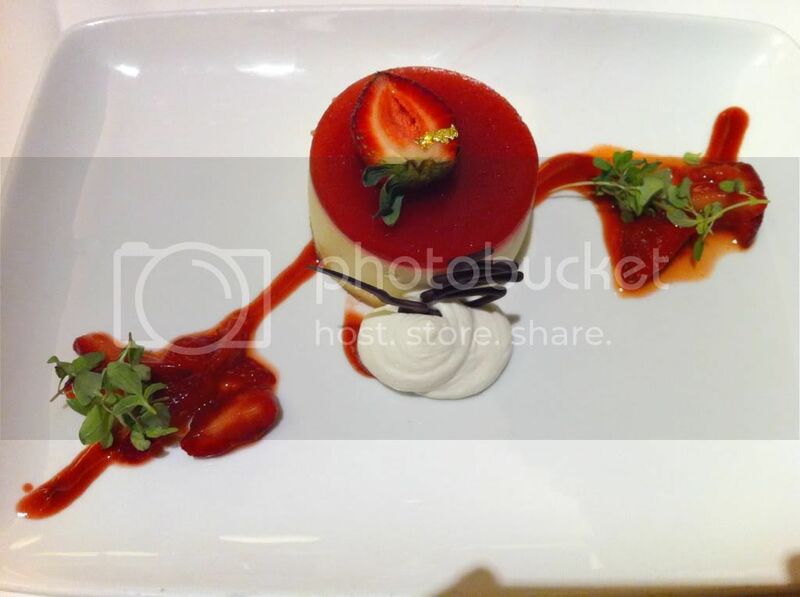 This was easily one of the fanciest cheesecakes I’ve ever had. Adorned with chocolate designs and gold leaf, this cheesecake not only looked hoity toity, it tasted great too. The cheesecake was very light, airy and almost fluffy. The flavor was subtle yet delicious, not too in your face. The strawberries were very fresh, as was the whipped cream; definitely not your momma’s cool whip. This restaurant definitely opened my eyes to the dining options in Disney World. Keep in mind that much like everything else in Disney, this place is not cheap. The food and style reminded me a lot of our local Michael’s Genuine Food and Drink with his every changing menu based on what’s readily available in the area. 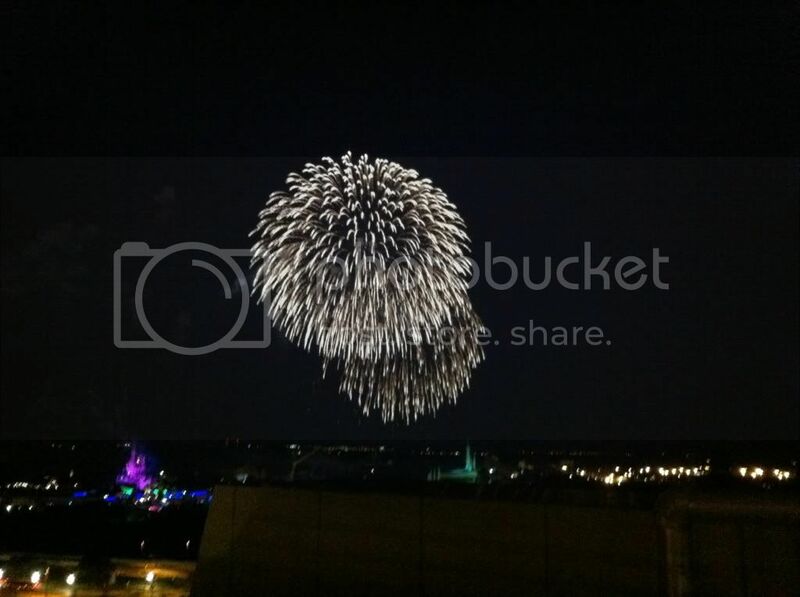 Even if you end up not dining here, everyone should check out the fireworks display from their observatory deck, it’s a completely different experience and with a fraction of the crowd. Now you know that if you’re in the Walt Disney area you can eat more than chicken fingers and turkey legs. Great write-up for a great restaurant, I enjoyed both. Perhaps on your next visit to 'the world' you and AJ of The Disney Food Blog could combine your powers. There are many hidden culinary gems to be had in WDW. I completely agree with you, Billy! The review and write up was very well done, and there are many, many culinary gems at WDW. We love eating there and try out new restaurants every time we go. I must admit, I don't think I've ever seen corn dog nuggets at the park ;) but I do have a special place in my heart for the cream cheese stuffed cinnamon pretzel. It's the only "park fare" we eat.